Months of inventory has reduced as we finished out the first quarter of 2019. Months of inventory is the amount of months it would take to sell out of homes if no new listings came to market. This illustrates the balance between supply and demand. We peaked at 2.9 months in September of 2018 and found ourselves at 1.2 months this March. The first quarter of 2019 saw 2,306 new listings and 2,096 pending sales – demand tracked quite well with supply! It remains a seller’s market (0-3 months of inventory), but not as constricted of a market as last year, which saw an average of 0.8 months in the first quarter compared to 1.5 months this year. As we head into spring, we should see continued growth in new listings and demand will be strong, fueled by low interest rates and positive jobs reports. The second half of 2018 had a large influx of homes that came to market, and an interest rate jump which created a gap between supply and demand. Buyers enjoyed some negotiations and credits in the fall and winter due to more selection, but as interest rates reduced in the first quarter, we saw demand increase. This is helping to absorb inventory and reduce the average days on market it takes to sell a home. Median price is up 7% complete year-over-year, which is still higher than the 4% norm, but much less than the unsustainable 12% gains from 2017 to 2018. This balancing out in the market has been a positive phenomenon as affordability has been a challenge for many. Both sellers and buyers are finding great opportunities in the current market. 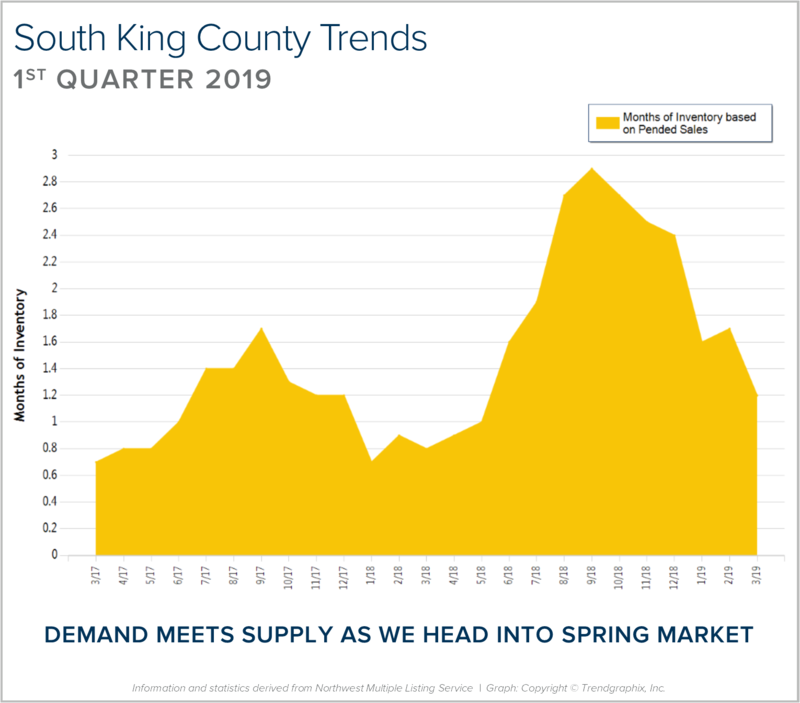 This is only a snapshot of the trends in south King County; please contact me if you would like further explanation of how the latest trends relate to you. Months of inventory has reduced as we finished out the first quarter of 2019. Months of inventory is the amount of months it would take to sell out of homes if no new listings came to market. This illustrates the balance between supply and demand. We peaked at 3.6 months in December of 2018 and found ourselves at 1.5 months this March. 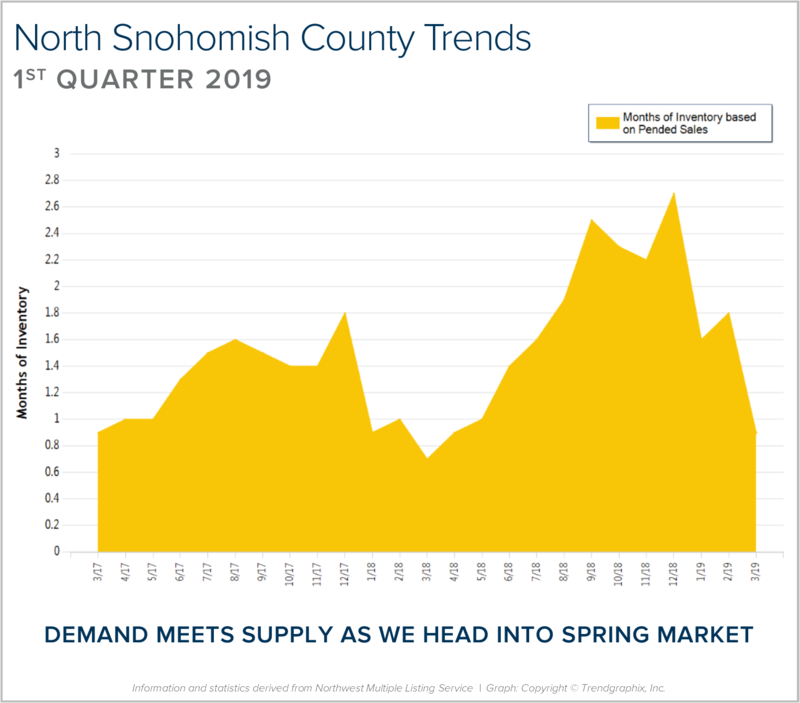 The first quarter of 2019 saw 2,304 new listings and 1,703 pending sales – demand tracked well with supply! It remains a seller’s market (0-3 months of inventory), but not as constricted of a market as last year, which saw an average of 0.9 months in the first quarter compared to 2 months this year. As we head into spring, we should see continued growth in new listings and demand will be strong, fueled by low interest rates and positive jobs reports. The second half of 2018 had a large influx of homes that came to market, and an interest rate jump which created a gap between supply and demand. Buyers enjoyed some negotiations and credits in the fall and winter due to more selection, but as interest rates reduced in the first quarter, we saw demand increase. This is helping to absorb inventory and reduce the average days on market it takes to sell a home. Median price is up 6% complete year-over-year, which is still higher than the 4% norm, but much less than the unsustainable 14% gains from 2017 to 2018. This balancing out in the market has been a positive phenomenon as affordability has been a challenge for many. Both sellers and buyers are finding great opportunities in the current market. 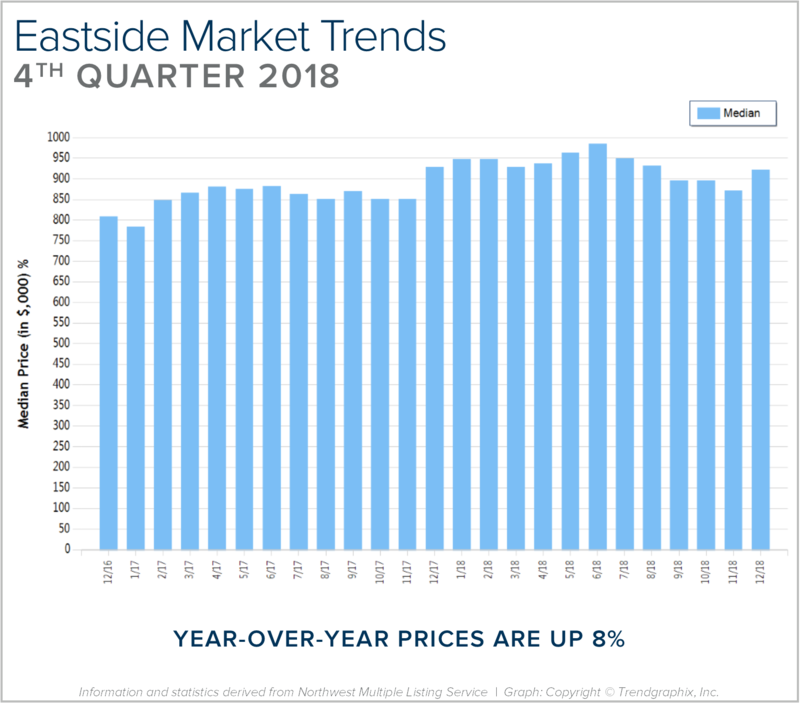 This is only a snapshot of the trends on the Eastside; please contact me if you would like further explanation of how the latest trends relate to you. Months of inventory was reduced as we finished out the first quarter of 2019. Months of inventory is the amount of months it would take to sell out of homes if no new listings came to market. This illustrates the balance between supply and demand. We peaked at 2.5 months in November of 2018 and found ourselves at 1.2 month this March. 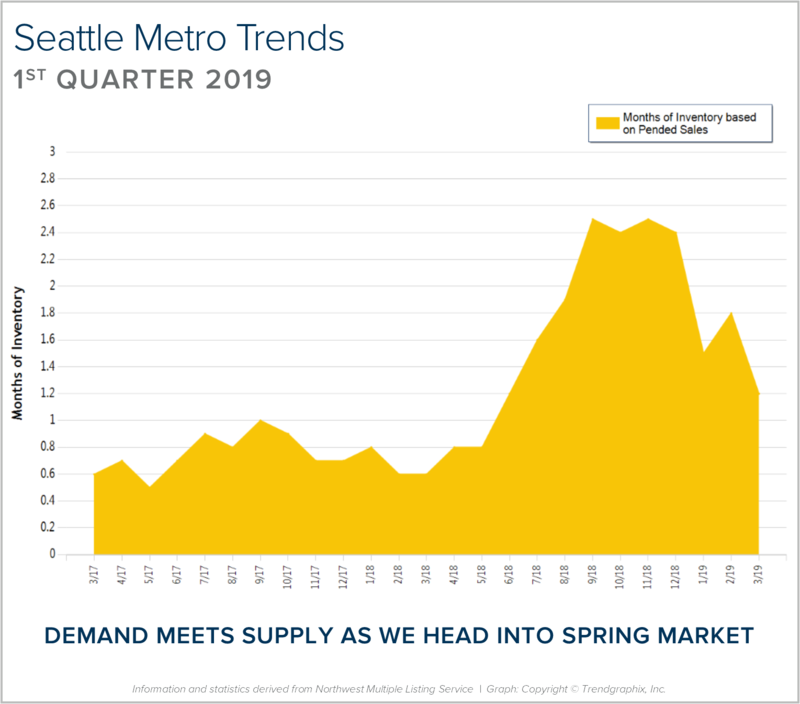 The first quarter of 2019 saw 2,456 new listings and 1,892 pending sales – demand tracked quite well with supply! It remains a seller’s market (0-3 months of inventory), but not as constricted of a market as last year, which saw an average of 0.7 months in the first quarter compared to 1.5 months this year. As we head into spring, we should see continued growth in new listings and demand will be strong, fueled by low interest rates and positive jobs reports. The second half of 2018 had a large influx of homes that came to market, and an interest rate jump which created a gap between supply and demand. Buyers enjoyed some negotiations and credits in the fall and winter due to more selection, but as interest rates reduced in the first quarter, we saw demand increase. This is helping to absorb inventory and reduce the average days on market it takes to sell a home. Median price is up 5% complete year-over-year, which is still higher than the 4% norm, but much less than the unsustainable 16% gains from 2017 to 2018. This balancing out in the market has been a positive phenomenon as affordability has been a challenge for many. Both sellers and buyers are finding great opportunities in the current market. This is only a snapshot of the trends in the Seattle Metro area; please contact me if you would like further explanation of how the latest trends relate to you. 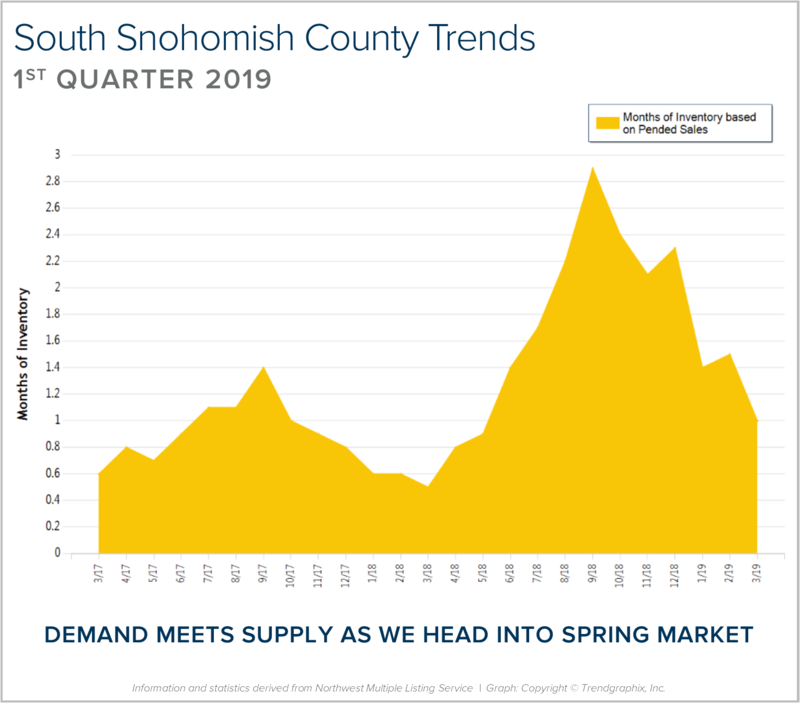 The first quarter of 2019 saw 1,667 new listings and 1,325 pending sales – demand tracked well with supply! It remains a seller’s market (0-3 months of inventory), but not as constricted of a market as last year, which saw an average of 0.7 months in the first quarter compared to 1.4 months this year. As we head into spring, we should see continued growth in new listings and demand will be strong, fueled by low interest rates and positive jobs reports. 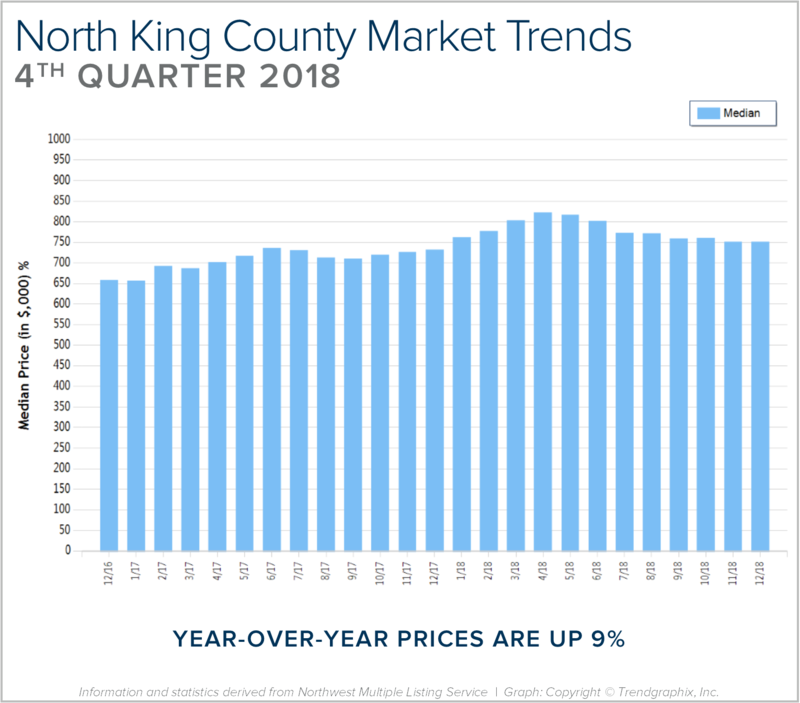 This is only a snapshot of the trends in north King County; please contact me if you would like further explanation of how the latest trends relate to you. Months of inventory was reduced as we finished out the first quarter of 2019. Months of inventory is the amount of months it would take to sell out of homes if no new listings came to market. This illustrates the balance between supply and demand. We peaked at 2.5 months in September of 2018 and found ourselves at 0.9 month this March. 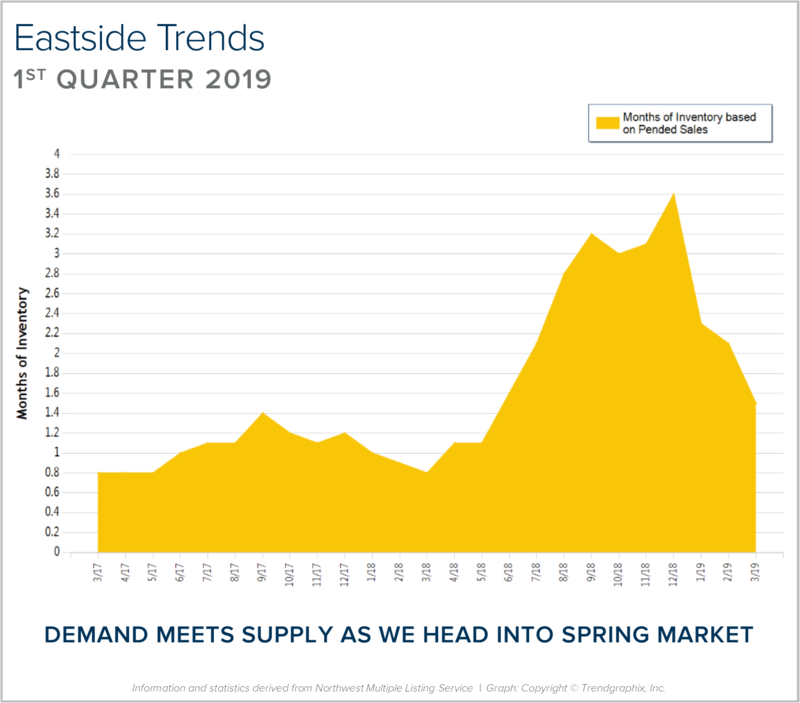 The first quarter of 2019 saw 934 new listings and 921 pending sales – demand tracked quite well with supply! It remains a seller’s market (0-3 months of inventory), but not as constricted of a market as last year, which saw an average of 0.9 months in the first quarter compared to 1.4 months this year. As we head into spring, we should see continued growth in new listings and demand will be strong, fueled by low interest rates and positive jobs reports. The second half of 2018 had a large influx of homes that came to market, and an interest rate jump which created a gap between supply and demand. Buyers enjoyed some negotiations and credits in the fall and winter due to more selection, but as interest rates reduced in the first quarter, we saw demand increase. This is helping to absorb inventory and reduce the average days on market it takes to sell a home. 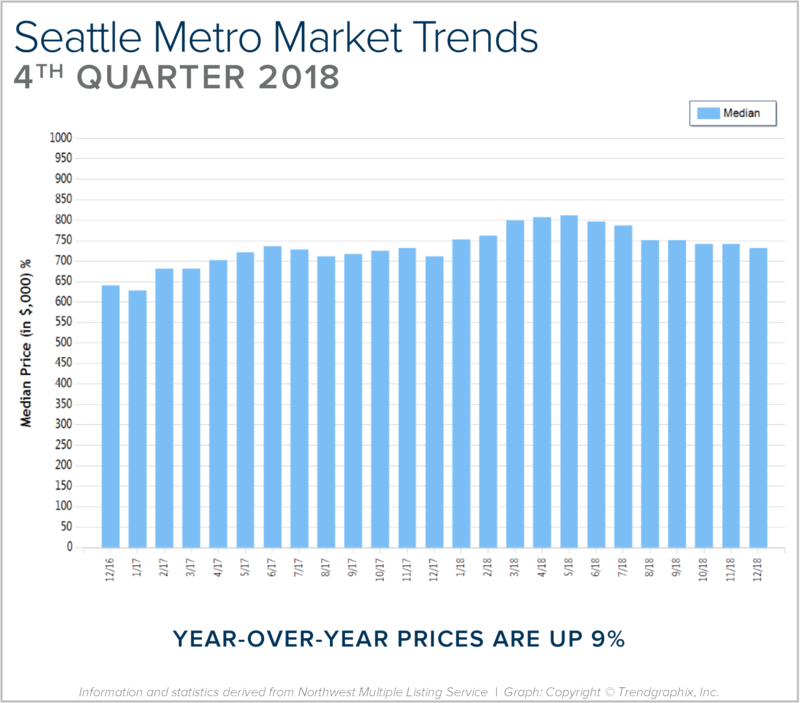 Median price is up 9% complete year-over-year, which is higher than the 4% norm, but much less than the unsustainable 12% gains from 2017 to 2018. This balancing out in the market has been a positive phenomenon as affordability has been a challenge for many. Both sellers and buyers are finding great opportunities in the current market. 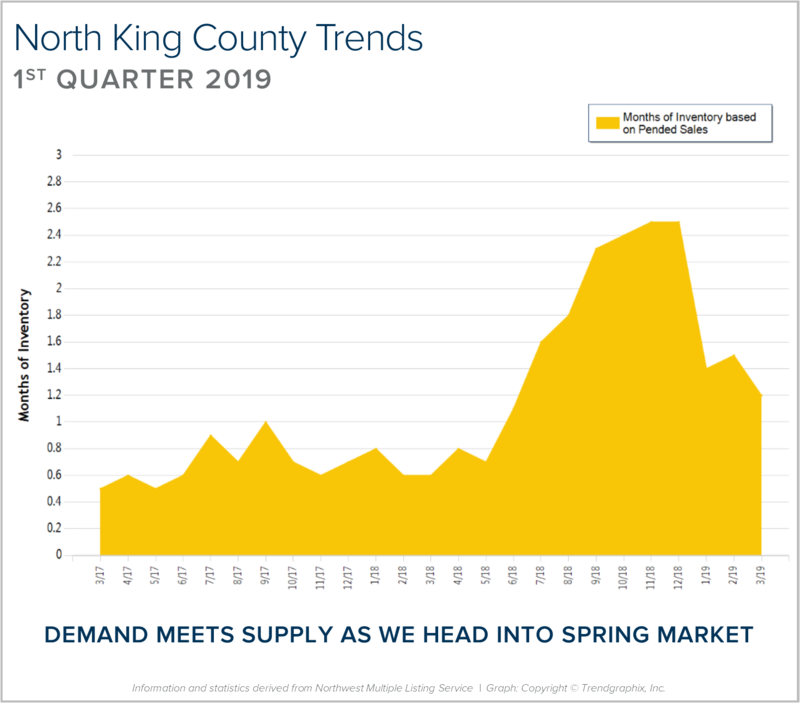 This is only a snapshot of the trends in north Snohomish County; please contact me if you would like further explanation of how the latest trends relate to you. Months of inventory was reduced as we finished out the first quarter of 2019. Months of inventory is the amount of months it would take to sell out of homes if no new listings came to market. This illustrates the balance between supply and demand. We peaked at 2.8 months in September of 2018 and found ourselves at 1 month this March. The first quarter of 2019 saw 1,708 new listings and 1,547 pending sales – demand tracked quite well with supply! It remains a seller’s market (0-3 months of inventory), but not as constricted of a market as last year, which saw an average of 0.6 months in the first quarter compared to 1.3 months this year. As we head into spring, we should see continued growth in new listings and demand will be strong, fueled by low interest rates and positive jobs reports. The second half of 2018 had a large influx of homes that came to market, and an interest rate jump which created a gap between supply and demand. Buyers enjoyed some negotiations and credits in the fall and winter due to more selection, but as interest rates reduced in the first quarter, we saw demand increase. This is helping to absorb inventory and reduce the average days on market it takes to sell a home. Median price is up 6% complete year-over-year, which is still higher than the 4% norm, but much less than the unsustainable 15% gains from 2017 to 2018. This balancing out in the market has been a positive phenomenon as affordability has been a challenge for many. Both sellers and buyers are finding great opportunities in the current market. 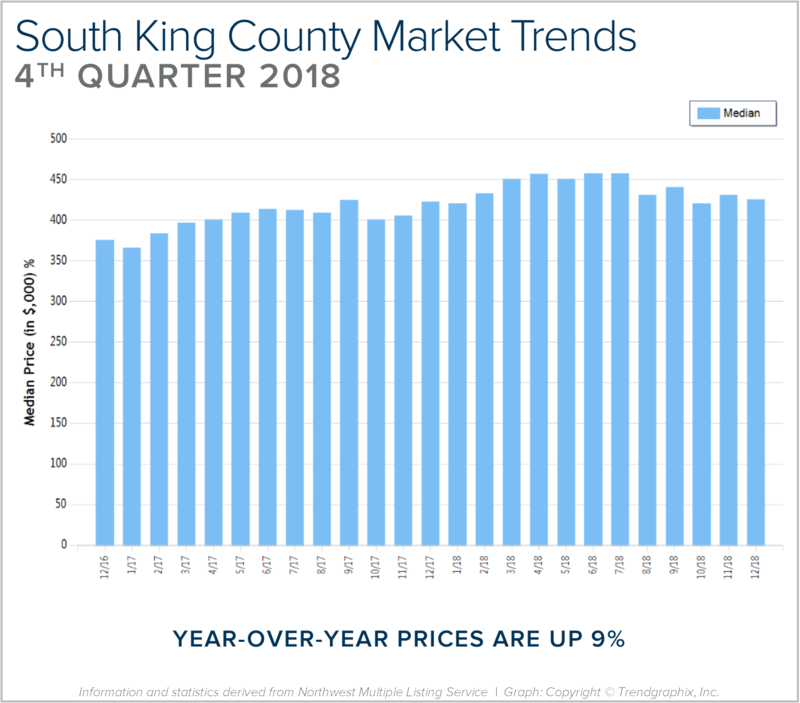 This is only a snapshot of the trends in south Snohomish County; please contact me if you would like further explanation of how the latest trends relate to you. 2018 was a year of change and growth. The market shifted from an extreme seller’s market, but still had strong gains. Year-over-year, median price is up 9% and since 2012 has increased 89%! Over the last 19 years, the average year-over-year price increase has been 6%. This puts into perspective the growth we have experienced, resulting in well-established equity levels. In 2018, inventory averaged 1.7 months, 30% more than 2017. This caused the month-over-month price gains to slow, and we experienced a price correction over the second half of the year. We expect to see more average levels of price appreciation in 2019 as the market continues to balance out. After six years of expansion resulting in an extreme seller’s market, in 2018 we encountered a market shift in the late spring. Inventory increased, interest rates took a jump, and demand took a step back to re-evaluate the new playing field. This resulted in a tempering of month-over-month price appreciation, and has established some long-awaited balance. This balance has brought opportunities for both buyers and sellers. Buyers have more selection and are negotiating terms like inspection items and concessions. Sellers are sitting on 6+ years of equity growth, and are now able to sell their home and make a move without fearing where they will land next. Interest rates are still well below the 30-year average, currently hovering just under 5%. We are seeing demand start to re-engage now that the new normal has settled in. 2018 was a year of change and growth. The market shifted from an extreme seller’s market, but still had strong gains. Year-over-year, median price is up 8% and since 2012 has increased 87%! Over the last 19 years, the average year-over-year price increase has been 6%. This puts into perspective the growth we have experienced, resulting in well-established equity levels. In 2018, inventory averaged 2 months, double that of 2017. This caused the month-over-month price gains to slow, and we experienced a price correction over the second half of the year. We expect to see more average levels of price appreciation in 2019 as the market continues to balance out. 2018 was a year of change and growth. The market shifted from an extreme seller’s market, but still had strong gains. Year-over-year, median price is up 9% and since 2012 has increased 93%! Over the last 19 years, the average year-over-year price increase has been 6%. This puts into perspective the growth we have experienced, resulting in well-established equity levels. In 2018, inventory averaged 1.5 months, double that of 2017. This caused the month-over-month price gains to slow, and we experienced a price correction over the second half of the year. We expect to see more average levels of price appreciation in 2019 as the market continues to balance out. This is only a snapshot of the trends the Seattle Metro area; please contact me if you would like further explanation of how the latest trends relate to you. 2018 was a year of change and growth. The market shifted from an extreme seller’s market, but still had strong gains. Year-over-year, median price is up 9% and since 2012 has increased 92%! Over the last 19 years, the average year-over-year price increase has been 6%. This puts into perspective the growth we have experienced, resulting in well-established equity levels. In 2018, inventory averaged 1.5 months, double that of 2017. This caused the month-over-month price gains to slow, and we experienced a price correction over the second half of the year. We expect to see more average levels of price appreciation in 2019 as the market continues to balance out.